Outdoor Decor finishing touches for outside living. Handcrafted transitional rug. Natural coir fibers, a renewable source. Pieces may vary due to the handmade nature of each product. Use in a protected area Handcrafted floor mat of certified non-slip vinyl. Pieces may vary due to the handmade nature of each product. For indoor or covered outdoor spaces. Wipe with warm water and mild soap. Handcrafted transitional rug. Certified non-slip vinyl. Pieces may vary due to the handmade nature of each product. For indoor or covered outdoor spaces. Handcrafted transitional welcome rug. PVC/coir; polyester flocking. Vinyl-backed coconut fiber Handcrafted transitional rug may be used indoors and outdoors. Made of durable polyethylene terephthalate (PET) yarn. Handcrafted Morning Glory entrance mat. 2' x 3'. Morning glories bloom on a robin's egg blue trellis. Detailed with a Courtly Check border. Crafted of natural coir. Traditional outdoor rug. Natural coir fibers, a renewable source. Handcrafted entrance mat. Made of 100% coir. Outdoor safe; use in a sheltered area to preserve rich colors. 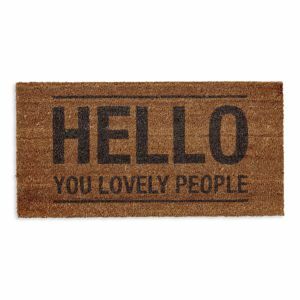 Hand-stenciled coconut fiber; vinyl backing Coir fibers Nothing says "welcome" quite like a bright, inviting pineapple. A practical addition to mudrooms, patios, and porches, this woven mat is made from rugged, coir fiber that catches dirt before it enters the house. Coir fibers; vinyl backing Hand-woven especially for terrain, this natural jute doormat is dressed up by two bands of black stripes. Handcrafted, decorative pillow made from solution-dyed Sunbrella® acrylic fabric. Stain, fade and water resistant. Handcrafted, decorative pillow made from solution-dyed Sunbrella® acrylic fabric. Stain, fade and water resistant. Handcrafted, decorative pillow made from solution-dyed Sunbrella® acrylic fabric. Stain, fade and water resistant. Handcrafted, decorative pillow made from solution-dyed Sunbrella® acrylic fabric. Stain, fade and water resistant. Handcrafted decorative pillow made from solution-dyed Sunbrella® acrylic fabric. Stain, fade and water resistant. Sealed insert of weather-resistant, faux down fiber. Machine wash cold, air dry. Handcrafted, decorative pillow made from solution-dyed Sunbrella® acrylic fabric. Stain, fade and water resistant. Corded pillow with embroidered butterfly. Sunbrella outdoor safe fabric (acrylic). Water-, fade-, stain- and mildew-resistant. From designer Elaine Smith. Inconceivably Outdoor®—Indoor Luxury, Outdoor durability. Luxurious "Faux Down" outdoor safe insert included. Acrylic. From designer Elaine Smith. Inconceivably Outdoor®—Indoor Luxury, Outdoor durability. Luxurious "Faux Down" outdoor safe insert included. Acrylic. Handcrafted pillow in geometric print. Encased polyester fiber fill. Solution dyed acrylic. Handcrafted and custom manufactured pillows. All fabrics are solution dyed acrylic. Handcrafted pillow. Solution dyed acrylic. Outdoor polyester insert. Sunbrella solution dyed acrylic. UV treated to resist fading and mildew. 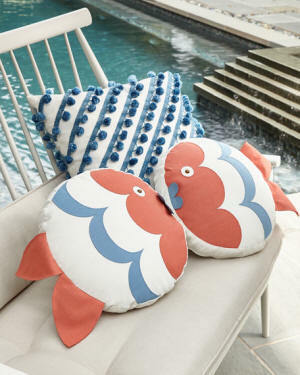 Make your favorite lounge chair even more comfortable with this sweetly tasseled outdoor pillow. Outdoor polyester insert. Sunbrella solution dyed acrylic. UV treated to resist fading and mildew. Navy outdoor pillows with tape trim or sand fringe. 20"Sq. Polyester. Polyfill insert. Rustproof zipper closure. Made in the USA. Eco-friendly indoor/outdoor throw. 60" x 60". Recycled polyester (more than 78 plastic water bottles). Machine wash cold. Outdoor safe. Made in the USA. 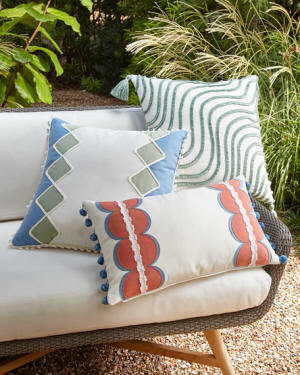 Outdoor pillow from designer Elaine Smith. 20"Sq. Acrylic. Faux-down insert. Handcrafted pillow. 18"Sq. Covered in solution-dyed acrylic. Spun Dacron® insert; does not hold water, mildew, or lose shape. Outdoor safe. Botanical print pillow with capped corners. Striped pillow with knife edge finish. Pillow in square pattern with self flange edge. Expertly tailored with sophisticated and timeless design. Handcrafted throw. Made from 78 recycled plastic water bottles. Face and mildew resistant. 60" x 48". Recycled polyester. Machine wash. Made in the USA. Crafted from weather-resistant materials, this textured pillow is a cozy addition to any living space - indoor or out. Outdoor pillows with fringe. 20"Sq. Polyester. Polyfill insert. Rustproof zipper closure. Made in the USA. 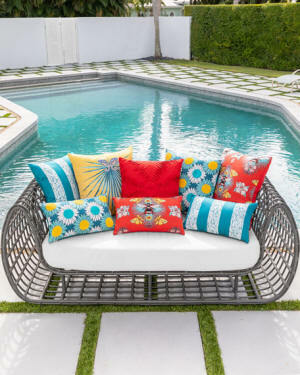 Make your favorite lounge chair even more comfortable with this colorfully striped outdoor pillow. Handcrafted transitional rug may be used indoors and outdoors. Made of durable woven vinyl. Flat-woven wool, cotton. Suitable for indoor or outdoor use. UV-resistant; rotate periodically for even wear Blue Morning Glory indoor/outdoor rug, 8' x 10'. Vivacious morning glories bloom against a delightful trellis and gorgeous sky blue; finished with a border of Courtly Stripes®. Designed for indoor and outdoor use. Handcrafted of polyethylene terephthalate (PET) yarn. Made of polypropylene/acrylic blend. Ideal for high traffic areas. Outdoor safe. A transitional power-loomed shag style collection that showcases a variety of neutral earth tone colors and over-scaled patterns. This unique combination serves to create a stylishly sophisticated and luxurious look. Tan/brown Handcrafted Poppies rug, 7'6" x 9'6". Hand-hooked polypropylene and acrylic. Polyester and latex backing. Indoor/outdoor use. Handcrafted Butterfly Blossom rug. Hand-hooked polypropylene and acrylic. Polyester and latex backing. Indoor/outdoor use. Handcrafted Knot & Rope rug. Hand-hooked polyester and acrylic. Polyester and latex backing. Indoor/outdoor use. Handcrafted Palm Beach rug. Hand-hooked UV-stabilized polyester and acrylic. Polyester and latex backing. Indoor/outdoor use. Size is approximate. Clean with mild soap and hose off. Inspired by the classic motifs of Native American blanket weaving and updated with blended colors reminiscent of ikat textiles from India, this rug is a global mélange that's perfect for seaside and rustic decorating themes Coastal-style inspired rug. Hand-woven polyester flatweave. Outdoor safe. A blend of naive folkloric symbolism and timeless stripes, this rug features a casual design that works equally well in both traditional and transitional rooms. Dip dyed ombré beach towel in cotton. Printed hammam reversed to terry. 550 GSM. Palm leaf printed beach towel in cotton. Printed hammam reversed to terry. 550 GSM. Beach towel in mixed pattern. Cotton; machine wash.
Dry off with the stylish Borderline resort towel from Hotel Collection, featuring a charming stripe design and a soft cotton fabric. Dry off with the stylish Circle resort towel from Hotel Collection, featuring a charming geometric design and a soft cotton fabric. "Healy" yarn-dyed woven stripe beach towel. Cotton looped terry.